We’ve got four learners in our house under the age of 10, so we’re right in the middle of homeschooling little ones. As all of my mama readers know, when you have kids, there are lots of great days, a good amount of okay days, and a fair amount of rough days. It’s important that we take a break to focus on what we have so we can appreciate it before it’s gone. I know that these days with my kids won’t last forever, so it’s up to me to value them NOW, rather than later. 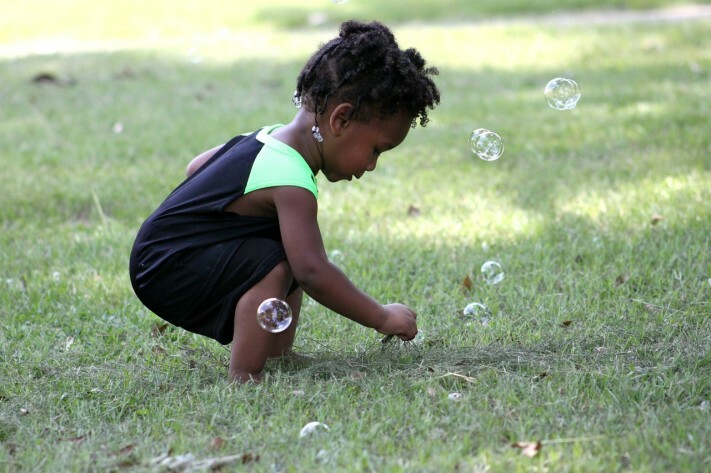 When I got the chance to write a “dueling” blog post with one of my fellow iHomeschool Network bloggers, I decided to write about why homeschooling little ones is easier than homeschooling teens. Now I have to admit: I have yet to homeschool a teenager. That means that I don’t actually know if teaching a young child is easier. But I wanted to take this opportunity to list seven reasons to enjoy these days with my kids – before they’re over. 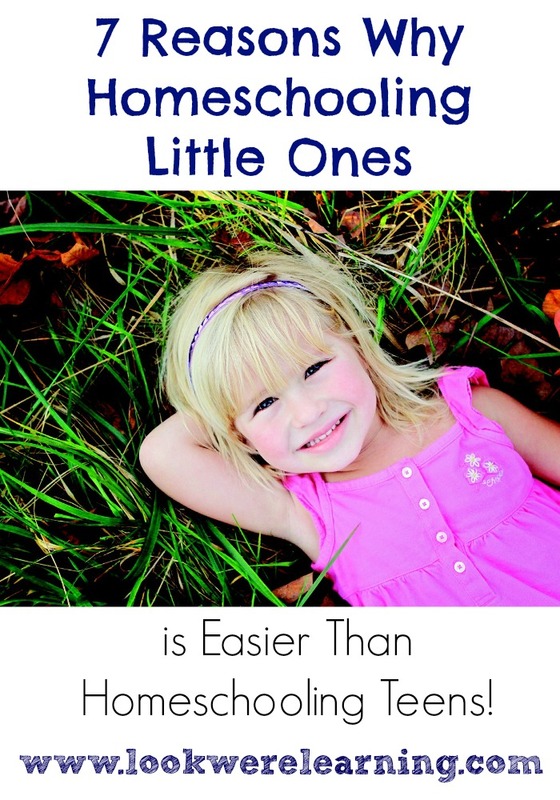 Here’s my list of seven reasons why homeschooling little ones is easier than homeschooling teens! 1. The subjects are easier to teach. When one of my kids has a problem understanding a math concept or pronouncing a word, I know I can help. As Tigger gets into middle school (in a couple of years), I’ll probably have to do some serious algebra studying before I can teach her! 2. Lessons are super fun! 3. You get to play during school! We spend A LOT of time playing during our lessons. We have a play break just after reading, then we follow that with P.E. after lunch. Since we’re homeschooling several ADHD learners, I often make our lessons into games using flashcards or pictures. 4. Crafts and activities are simple and quick. I’m a textbook over-planner, and I tend to put wayyyy too much time into lesson planning in general. But when I put together a craft or an activity for my kids, the simpler the better! Sometimes just putting out a couple of different play dough colors is enough to interest them for an hour or more. 5. There’s plenty of room for hugs! When one of my kids isn’t feeling good, I get to sneak some snuggle time into the school day. Piglet is teething right now, and sometimes she just comes up and lays on my chest as we read. That’s enough to turn my whole day around. 6. The school day is very relaxed. We’re very, very relaxed during the day with the kids. I use an ADHD friendly homeschooling schedule to keep everyone on task (including me! ), but I’m very relaxed about sticking to it. It’s easier to do that now when they’re young, since our list of educational objectives isn’t too long yet. 7. You will never, ever, ever be bored during a lesson! And the final reason why homeschooling little ones is easier: It’s never boring! No matter how exhausted I may feel or busy I may become, I know I’ll never be bored while I’m teaching my young ones. I get to spend most of my day with them, and I love that we can share these early years together. Are you homeschooling little ones or teens? Have you homeschooled both? I’d love to hear your experiences in the comments! 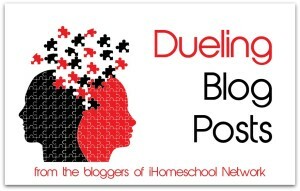 This post is part of the “Dueling Blog Posts” linkup from iHomeschool Network! My friend Kris Bales has shared her reasons why homeschooling teens is easier than homeschooling little ones, so be sure to check out her post! I loved this post 🙂 I definitely agree that I love homeschooling my little guy. He just turned two yesterday, and I know that our school days are going to be filled with games, fun, and so many hugs! I can definitely imagine that homeschooling a teen would look really different – I’m pretty sure that the math part would completely stump me. My girls are in the same age group, and I really enjoy homeschooling them during this season. We are a mix of independent and mommy or child-directed. Thanks for sharing! I have yet to homeschool a full fledged highschooler. But my almost twelve yr old is attempting to do 7/8th together this year. And I have a 3rd grader and a preschooler as well. And while I really enjoy many aspects of homeschooling younger ones, I have to say that as my kids get older and more capable of taking on more responsibility for their own educations, the more I have to give of myself to our family and myself in other areas. There are so many tools out there now that can help overcome roadblocks, and there are so many people in our community who have amazing specialities, so me not knowing how to teach or help in a certain area is not something I feel especially stressed about. For me, making sure their foundations are sound has been and continues to be my primary focus. If I teach them HOW to learn, and make learning a natural avenue of curiosity, then they will continue to thirst for it throughout their lives. And that is my aim.